After watching some Australian Vietnamese dude’s cooking show on TV at Mike and Robert’s place, I was craving the pork spare rib noodles he ate at a market somewhere in the north of Vietnam. Marinate the spare ribs in some nam pla, grated garlic, black peppercorns, salt, white pepper and little bit of sugar (anywhere from 1-4 hours). Use that marinated meat to make a stock. I added scallion, onion and star anise in the last hour. Just let it simmer until it has good flavor. Strain the stock and adjust the seasoning with nam pla, salt and white pepper. 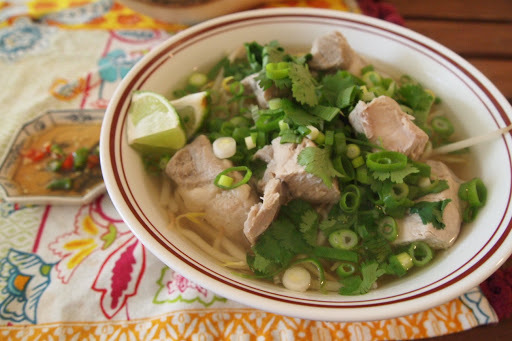 Soak the pho in hot water until soft and reheat in boiling water with beansprouts. Drain and place in a warm bowl. 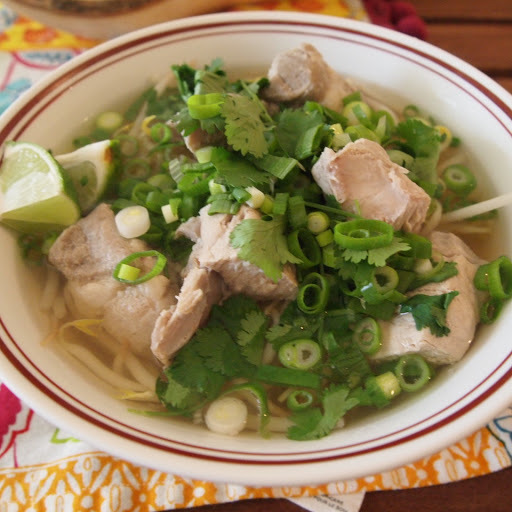 Pour the spare rib broth over the noodles and top with scallion, cilantro and lime wedges. I usually eat pho with a mixture of cut thai bird chillies, minced garlic, nam pla and lime juice on the side. The stock takes some time but this is a satisfying, hearty yet light, simple bowl of noodles to make on a cold winter’s day!